PhotoRescue Pro es un potente programa creado para recuperar todo tipo de archivos desde multitud de dispositivos portátiles, tales como cámaras digitales, PDAs y teléfonos móviles. El proceso de recuperación consta de simples pasos totalmente asistidos que te ayudarán a no perderte ninguna parte de la tarea. Bastará, a grandes rasgos, con detectar la unidad en la que se buscarán lo archivos ‘recuperables’, seleccionar el tipo de archivos a recuperar y el directorio de destino. PhotoRescue Professional recovers lost data from a whole host of multimedia devices – from digital cameras to PDAs and mobile phones. 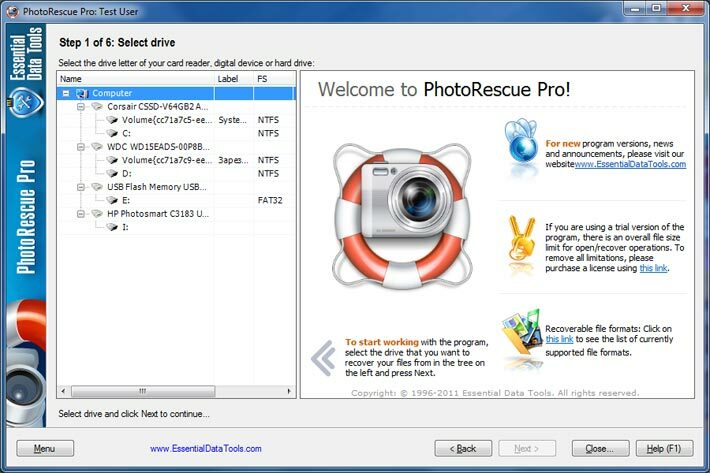 PhotoRescue Pro supports CompactFlash cards (type I/II), IBM Microdrives, SmartMedia cards, MultiMedia cards (MMCs), Secure Digital (SD) cards, Memory Sticks, and any other storage devices (of course, “normal” Hard Disks and Floppy Disks too). Modern cameras and other digital devices allow files to be erased and the space on the media reused. Through momentary carelessness, valuable pictures can be lost in an instant. The media can also be bulk-erased or formatted, removing everything from the storage media. Now, you won’t loose it all because somebody clicked the wrong button. Whether you unintentionally deleted your holiday snaps or formatted pictures on your data medium or have pulled it out during a write operation, not to worry – PhotoRescue Pro is here to easily, quickly and absolutely reliably reconstruct the missing data. 0 Response to "PhotoRescue Pro 6.4 Build 923 (NEW)"